Century Communities – Display Advertising & Remarketing | ASTRALCOM - Content Strategy, Conversion Marketing and Customer Acquisition. Century Communities – Display Advertising & Remarketing | ASTRALCOM – Content Strategy, Conversion Marketing and Customer Acquisition. Century Communities partnered with ASTRALCOM for their adZooks! 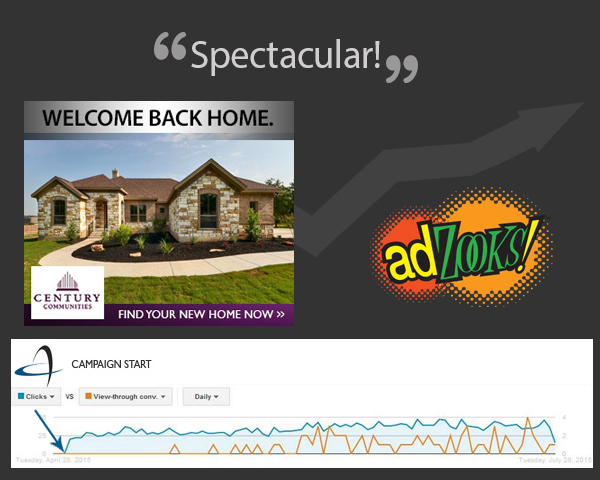 display and remarketing program to increase brand awareness and drive targeted homebuyer traffic in its Austin market. In less than 20 days, adZooks! became the 3rd top paid referring source, across the entire Century Communities website and quickly increased their traffic by 13%! This press release provides more info. Give us a call at 800.536.6637 or contact us to connect with consumers looking for your product or service.